The US should engage Pyongyang and encourage its leaders to pursue economic reforms that would improve the lives of its people. Today saw continued turmoil and bloodshed on the northern half of the Korean peninsula. Troops loyal to dictator Kim Jong Un have continued their struggle to maintain control of the Kim family stronghold in Pyongyang, fighting to push back the advance of forces loyal to DPRK General Hwang Pyong-so. Hwang, who sought to oust the ruling North Korean dictator in May 2016, continues to proclaim that the end of the Kim family dynasty is near. Meanwhile, rumors of widespread atrocities and human rights abuses by both sides, including the suspected use of chemical weapons by Kim’s regime in July 2016, has heightened fears in the global community that the growing civil conflict could provoke an armed intervention by China, South Korea, or the United States. With Pyongyang threatening to “break the Earth with nuclear weapons” if the growing rebellion does not subside, the world waits warily for what tomorrow will bring on the Korean peninsula. For now, this news story is fiction. But without determined foreign engagement by the United States and its allies—promoting economic reforms and political stability in North Korea—Pyongyang may soon face a Syria-style conflict that could bring unimaginable chaos to the divided Korean peninsula and East Asia. With Kim Jong Un continuing to purge his generals and political advisers, there is the growing possibility that a high-ranking official may attempt a coup d’état to prevent his own execution (probably by anti-aircraft fire.) Such a development, along with any popular revolt against the regime, will not bring a swift end to Kim’s government. Instead, it will provoke a protracted and extraordinarily deadly conflict that will threaten the stability of the region and the global economy. This is not fearmongering; this is an increasingly likely possibility. To prevent such a tragic scenario, the Obama administration must engage Kim Jong Un’s regime and reevaluate the fundamental purpose of negotiations with it. North Korea is not going to give up its nuclear program, and the U.S. is just as unlikely to recognize the DPRK as a nuclear weapons state. Engagement with Pyongyang, however, can still play a positive role in promoting stability on the divided peninsula. Bilateral talks—in which the U.S. should quietly extend security guarantees as well as offers for cultural and academic exchanges—may diminish the insecurity of the North Korean leadership and give Pyongyang the needed breathing room to risk implementing Sino-style industrial reforms. Economic growth in the DPRK offers the safest way to improve the lives of the Korean people in the north and preserve the prosperity of those who live in the south. The broader objective of peaceful reunification will have to come after years of gradual political progress. In the meantime, disastrous consequences may ensue if the North Korean state begins to collapse as a result of systemic economic problems or an audacious coup attempt. The resulting conflict could spill over the DPRK’s borders. Such chaos would imperil South Korea’s economy and send shockwaves through financial markets in East Asia and beyond. South Korea, China, and the United States would consider intervening militarily. And Kim Jong Un’s regime might use nuclear weapons against its own people to survive. Economic reforms by the North Korean state may bring about similar instability through a chain-reaction of unanticipated events, but the indefinite maintenance of the status quo is certain to bring chaos sooner or later. While the North Korean government has successfully implemented agricultural reforms, Kim and his advisers are still unwilling to implement sustained changes in the national economy. Yet North Korea—to draw on the words of the scholar Andrei Lankov—remains something akin to a medical patient with brain cancer; the disease, without radical treatment, will inevitably prove fatal. The only remedy is a risky surgery that leaves the patient with uncertain odds of survival. Kim Jong Un’s regime confronts this very dilemma. The proverbial cliff may be closer than anyone realizes. The North Korean people outside of Pyongyang are becoming more aware of their horrendous poverty thanks to an influx of information coming in over the Sino border. With Kim carrying out violent purges in recent years, killing over 70 top officials by recent estimates, the upper echelons of the regime are assuredly uneasy. No one is safe. The DPRK might stagger on as it is for some time, but a coup attempt or a popular revolt is an ever more serious possibility. People are not always inclined to wait for their own funeral. That scenario is unlikely to serve the best interests of the Korean people, north and south, or the United States. Indeed, Kim Jong Un, no doubt having seen Muammar Gaddafi’s final moments on YouTube, would use every ounce of military power at his disposal to preserve his rule. If he was assassinated, a member of his family might assume control and invoke the legacy of Kim Il Sung in existential desperation, leading part of the armed forces and population to rise up and defend the state. 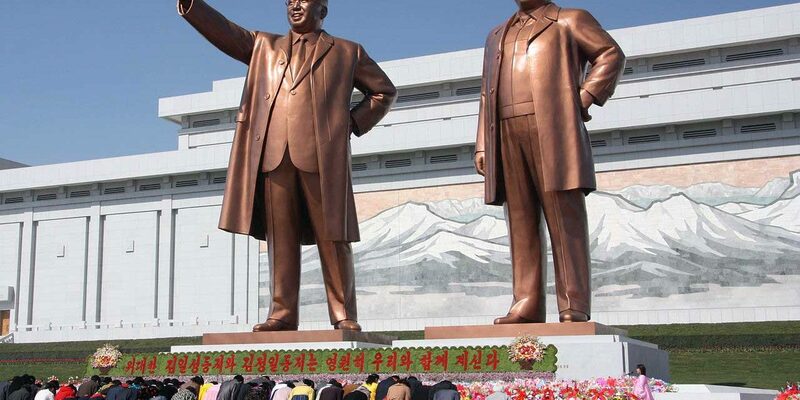 (Remember, the people of the DPRK have worshipped the “Great Leader” from their earliest years. If his successors lack his revolutionary legitimacy, the original Kim remains a powerful symbol that inspires genuine loyalty for the state.) At the very least, a large part of the elite class living in Pyongyang—in a similar vein to Assad’s Alawite sect in Syria—would probably back the Kim family dynasty. The alternative is the end of their way of life, if not their actual lives. Additionally, any effort by a member of the government or military outside of the Kim family to assume control of the DPRK is likely to fail. The legitimacy of the regime, and its ability to inspire the populace to endure hardship, is intertwined with the bloodline of the ruling family. Dramatic changes in North Korea are on the horizon. The risks will be immense. The question is whether the United States will attempt to shape those events to its interests or whether it will simply respond when a potentially avoidable cataclysm erupts on the northern half of the peninsula. The United States has limited power to influence events in North Korea, but it can engage Pyongyang and encourage its leaders to pursue economic reforms that would improve the lives of its people and potentially preempt political instability. No matter how repugnant Washington finds Kim’s regime and its treatment of the Korean people, the looming possibility of civil war in North Korea leaves it little choice. Brandon K. Gauthier is a PhD candidate specializing in US-DPRK relations at Fordham University.